"Receive now two isolationist epics as displayed on the debut demonstration cassette of SAMMAS' EQUINOX (FI) entitled "Pilgrimage". The Finn triumvirate (also known for their works in BLOOD RED FOG and PANTHEON OF BLOOD) performs desolate and pitch black, glorious and luminous Hyperborean Black Metal, in the vein of ILDJARN yet tainted with their very own sense of melody. The release comes on pro-cassettes limited to 200 copies and can be previewed here." 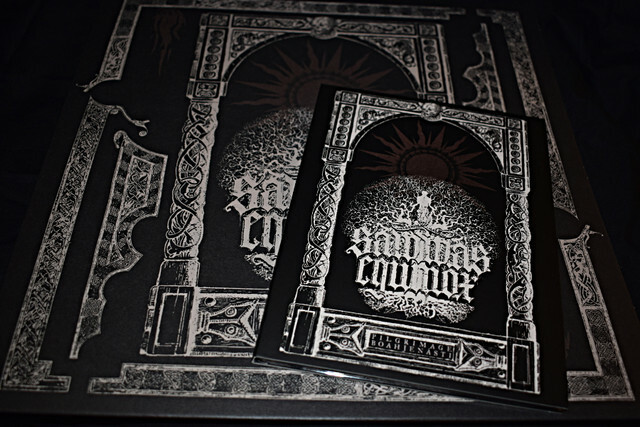 SAMMAS' EQUINOX "Boahjenásti" MC now available from SolHarvest. "The Finnish triumvirate return with three hymns of mythological Hyperborean Black Metal. Mystical echoes from ancient times, towards the Shores of Pohjola. Comes onto pro-cassette in lavish sleeve with booklet, courtesy of Primeval Vision." Accurately titled, Pilgrimage / Boahjenásti features both of SAMMAS' EQUINOX's demo tapes, respectively released in 2016 and 2017. Together, this collection features newly remastered sound courtesy of Moonsorrow's Henri Sorvali. Although exhibiting the stultifying rawness that has come to mark much Finnish black metal in the post-Strength & Honour landscape, there's a uniquely atmospheric aspect to SAMMAS' EQUINOX, both in the band's bittersweet melodicism and their deftly subtle approach to sound layering. The seven songs comprising their oeuvre to date burn with a filthy intensity in the best Finnish tradition, yet just as equally exude a somber, even tender quality that's come to mark countrymen Cosmic Church, Kêres, and especially Circle of Ouroborus. Likewise, there's a certain punkishness here that paradoxically doesn't make the band's black metal sound punk at all. And the mystery's just begun... Get on SAMMAS' EQUINOX's bandwagon now with the Pilgrimage / Boahjenásti collection or forever curse yourself. Last edited by Feuer Publications on Tue Mar 26, 2019 5:56 pm, edited 1 time in total.